Soulfly’s 10 Studio Album Coming Soon! Soulfly is in the studio as I write this. We’re working on the new album, their 10th studio album. Armed with Max Cavalera’s four-stringed guitars, unmistakable growl and instantly recognizable riffage, the muddy tones and constant rhythmic bounce of SOULFLY has retained its gritty edge while pushing the boundaries of what’s possible in metal. 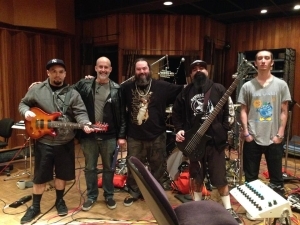 In the studio is lead guitarist Marc Rizzo (who has been in SOULFLY almost as long as Max was in SEPULTURA), bassist Tony Campos (Static X, Ministry, Prong) and Max’s 21 year-old Zyon, who splits his time between drumming in LODY KONG and SOULFLY. By admin|January 8th, 2015|Categories: Music News|Tags: marc rizzo, max cavalera, soulfly, tony campos, zyon|Comments Off on Soulfly’s 10 Studio Album Coming Soon! Copyright MattHyde.com | All Rights Reserved | Site by DuffWeb.